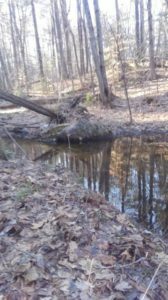 I fished a new stream earlier this week. Although it ran clear, the water was still cold from snow melt. Since I never before had fished the stream, I had nothing to go by. I didn’t know how many fish were there or where their usual lies were. 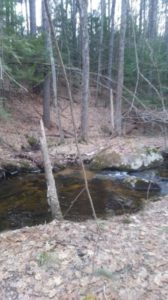 I searched all the typical types of holding water (riffles, runs, plunge pools) to try to find wintering areas. Nothing. 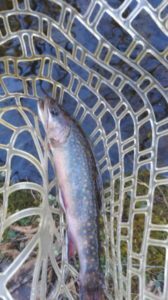 Eventually, I spotted several feeding brookies in a stretch of slower water. Carefully, I snuck up to a good casting position. It was very technical fishing, and I had to plan every movement and cast before executing it. Usually, I sat on my knees for a good five minutes studying each individual fish, the current, and surroundings before casting. I went three-for-five. There wasn’t too much of a secret to my technique. I fished a naked Rainbow Warrior (without a weight or indicator) by casting upstream of the fish and letting it dead drift. I registered strikes by watching the fish for signs. 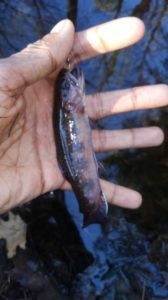 If I saw the white of its mouth or watched it shift near my nymph, I set the hook. Often times, I saw the fish strike before the line even paused. Eventually, as the evening wore on, my casting got a little sloppier, and, I caught more snags than fish. I decided to call it an evening, satisfied with the result. With spring just around the corner, I look forward to more days on the water and some decent dry-fly action. I still can’t believe how lucky I am to catch fish like these in places like this only 15 minutes from my house. Ashu, that’s not just scouting that’s fishing 😉 Sight casting to wild and skittish brookies in a tight spot stream is top notch fun in my book! Thanks Jamie. Seeing those fish actively feeding this time of year was more than I could have hoped for!